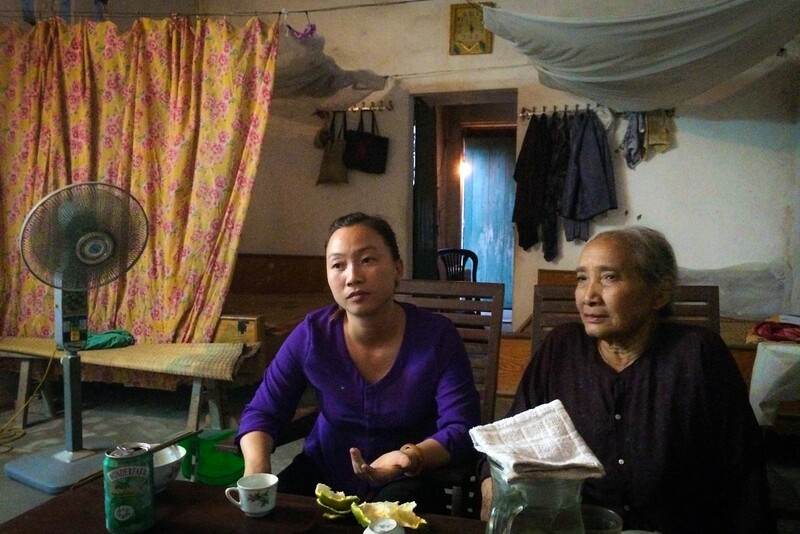 Meet Mrs Vu Thi Thai, an extraordinary woman we met in Northern Vietnam. 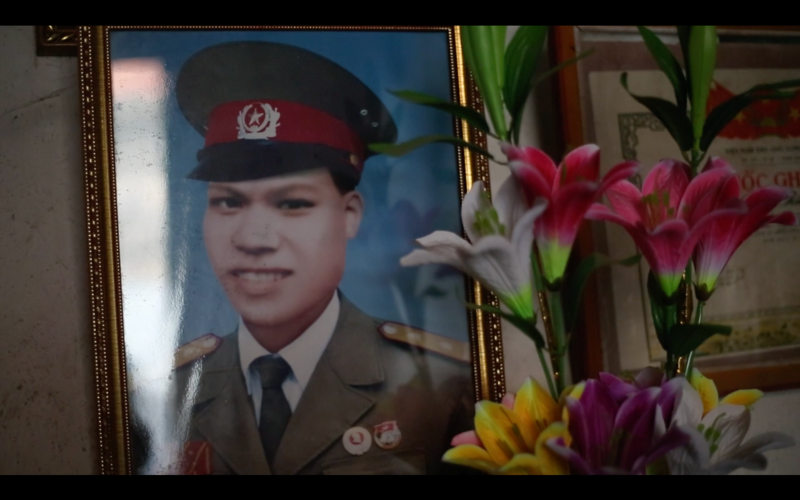 Like many others in Vietnam, Mrs Thai was heavily affected by the American (Vietnam) War. She lost her husband to the conflict when her son was only 4 years old, and she has remained without a partner since. As we discovered from our time with her, she is fiercely loyal to the husband she lost such a long time ago. It was during our homestay experience in Yen Duc village when we asked if there was someone in the village whom we could talk with more about village life in Vietnam. What we thought would be an interesting insight into life in Vietnam, became a captivating, emotional rollercoaster, as she talked frankly about her life, the husband she lost to the Vietnam War, and her life since then. 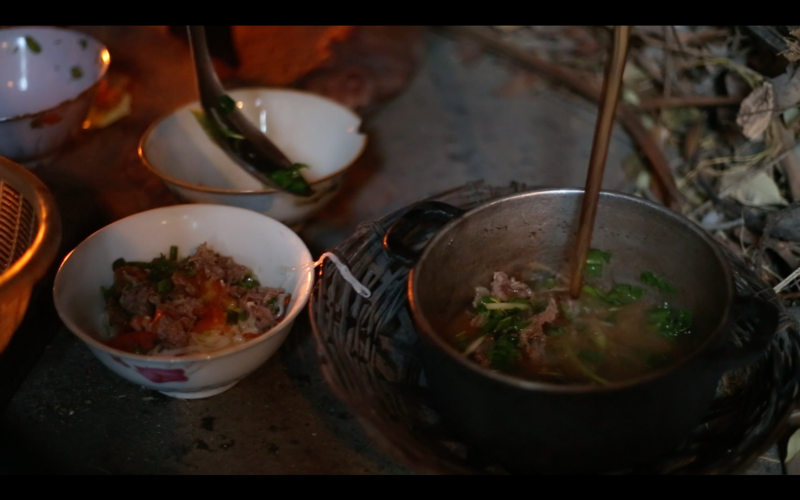 As with most of our interactions with locals in Vietnam, our talk with Mrs Thai revolved around food, as she prepared a traditional dish of Pho Bo (beef noodle soup) for us. Mrs Thai’s story touched us in a deeply emotional way. Just like our experience at the War Remnants museum, where the atrocities of the American War were laid out in brutal, frank detail, the story of her short marriage and subsequent life filled us with sadness. From her perspective, she tells the story in a perfunctory manner, without a hint of emotion. Perhaps the years have dulled the pain, or perhaps, as she said herself, she still feels her husband’s presence often, taking comfort from this. Our first interaction with Mrs Thai was typical of her strength of character and independence. We turned the corner of the narrow alleyway in Yen Duc village, and pulled up alongside a metal gate on our bicycles. 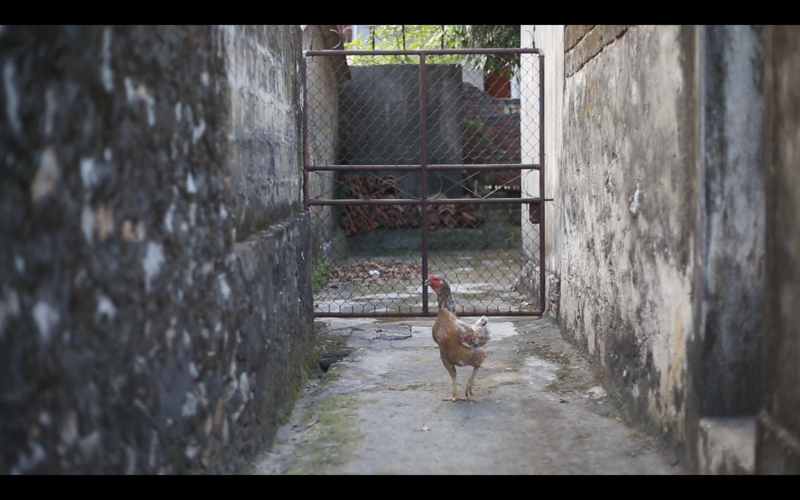 To our right, down the alleyway was a dead-end, nothing but a gate…and a rogue hen that had escaped Mrs Thai’s yard. We didn’t know it at the time, but this would be our first interaction with Mrs Thai. She came out of her home, a wide smile on her face coupled with a steely determination. She poked her head into the alleyway to see what all the commotion was about. Spotting one of her hens there, she didn’t hesitate, and went after the hen with vigour. We looked on in intrigue, after all, we wouldn’t know where to start when it came to catching a rogue hen! Her first attempt at capturing the hen ended in failure, flapping its wings vigorously, it flew above her and back down the alleyway. But she wasn’t done with it yet. She hobbled back down the alleyway to corner the hen again. Again it launched itself into the air, and as soon as it hit the ground, Mrs Thai was down low, scooping it up by its legs and carried it back into her yard, a wide smile across her face. She seemed to revel in the challenge. We were to learn this was typical of her attitude and resourcefulness, even at 70 years of age. 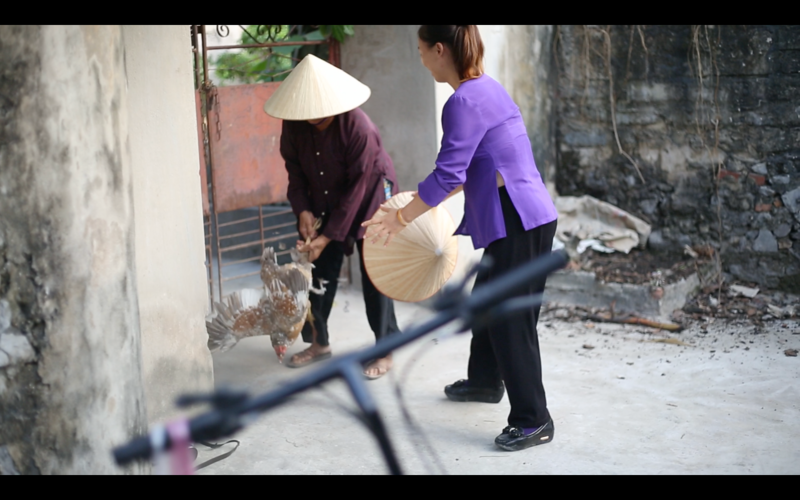 As she wandered back into her home, Huong, our guide motioned for us to enter the yard and home. “This is Mrs Vu Thi Thai, my neighbour.” She said. 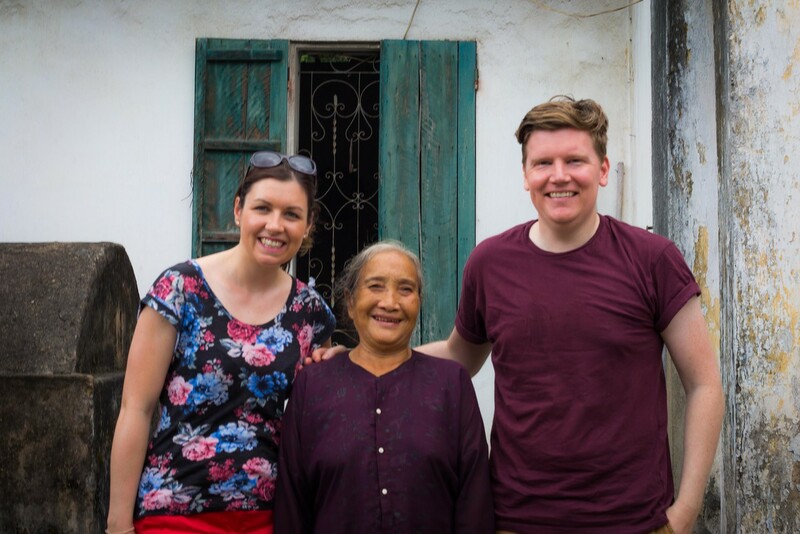 As we entered her home, we felt much warmth from Mrs Thai, a common theme with our interactions with the Vietnamese people we had met. She spoke no English, but her voice was so distinct we would recognise it anywhere. As we entered the home, our guide translated for us. A day earlier, we had asked our guide if there was anyone in the village who would like to be featured in a very short film about their lives, and Huong had asked her neighbour if she would be interested. She jumped at the opportunity, and apparently she had been telling everyone in the village she was going to be famous! She led us into her tiny kitchen area, the walls blackened by decades of a wood burning fire in the corner of the room. Along one side of the kitchen were wooden logs and sticks, stacked high in preparation for winter. In the corner lay a small area of concrete, where Mrs Thai was gathering various small twigs and sticks into a pile. She lit the fire, and hobbled off to get the food we had brought for her to cook. We sat there, crouched on the floor of the kitchen and waited. She returned with an array of vegetables, spices and herbs for our lunch, and without fanfare began cooking. 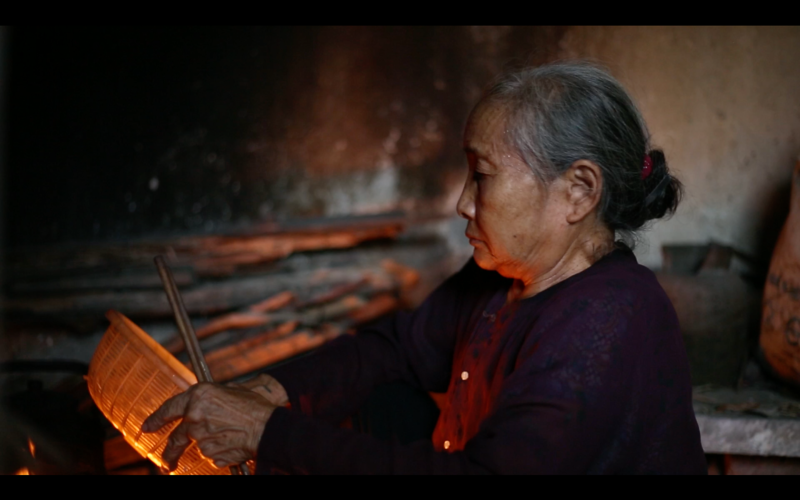 As she cooked, Huong, our guide (and her neighbour), asked Mrs Thai about her life, and she reeled off the story you heard in the short film above. This wonderful woman, crouched over her wooden fire, reliving the saddest moments of her life as she made our lunch. It was a truly humbling experience, one that really really touched us. After she finished cooking, we sat and ate our soup in the living area. 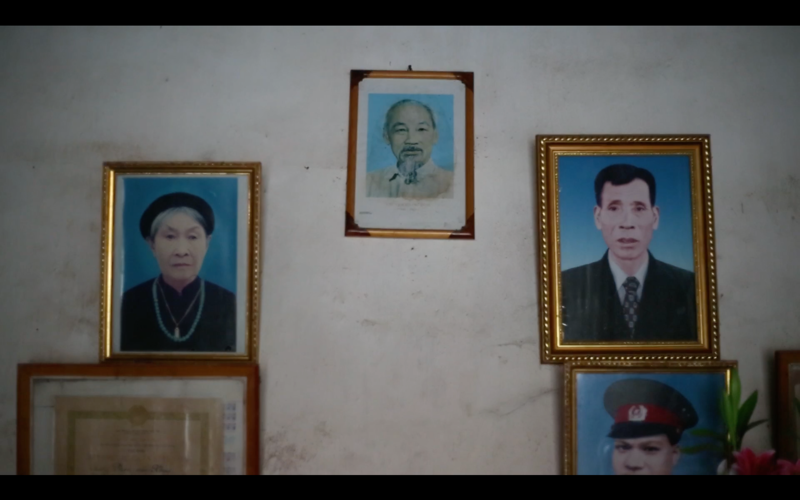 Above us on the wall, hung proudly just below a photo of Ho Chi Minh, was her husband, forever young in his military clothing. She was keen to point him out, and commented on how handsome he was! We agreed. Although we felt sadness for her, she didn’t feel sorry for herself. She had made a good life for herself, she had her son (now 47) and his wife and children, and a brother in the village, as well as neighbours looking out for her. After a little while chatting, and many smiles between ourselves and Mrs Thai, it was time to bid her farewell. We felt sad to leave, but her neighbour told us we had made her year just spending time with her, and she’ll be telling everyone in the village about it for months to come! As much as she may have enjoyed her time with us, she probably had no idea how much of an effect she had on us. As we left, Laura burst into tears as we cycled back to our homestay for the evening. It had been an emotional afternoon. We decided we would buy her a gift and return tomorrow to surprise her with it. The next morning, we headed to the local market in search of a scarf for her for the impending winter. We couldn’t find one, but settled on buying her a brand new pillow to sleep on as the ones she had looked very old. We returned the following morning, taking her by surprise as we entered the yard. She smiled and said something as she hobbled quickly into the house. “Have we upset her?” We asked her neighbour nervously. We laughed, and waited for her to emerge. When she returned, we gave her the new pillow, and she offered us to stay for lunch, such was her generosity. We laughed, and promised to do so. We rounded the corner of the alleyway, and headed back into the lanes of Yen Duc village, our heads full of emotion and thoughts as we cycled back to our homestay. For all the epic adventures we have when we travel, there is nothing better than the impact of spending time with a local, listening and learning about their lives, hoping to understand even a little insight into the countries and cultures we visit. We might talk mostly about the epic treks we take on, or the famous monuments we visit, but it’s the people we meet who remain in our thoughts, and in our hearts. We will never forget our time with Mrs Thai. That is such a emotinal story, thanks Laura and Barry for telling this. Thanks Andy – we were really happy to share her story! Life experiences like this that become the most powerful images of your trip. We really enjoyed reading it and watching the film. Also you obviously made Mrs Thai a happy person that day. Thanks Kenny, it really was a moving experience and certainly something we won’t forget for a long time!